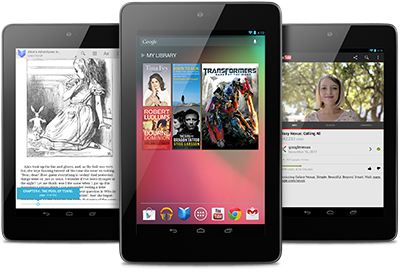 Nexus 7 was made for Google Play, so all the entertainment you love is right in your hand: the world’s largest collection of eBooks, millions of songs, thousands of movies and TV shows, and a growing selection of magazines – plus over 600,000 apps and games. On paper, the specs for the Nexus 7 are quite impressive. Powered by a quad-core Tegra 3 processor with 1GB RAM and either 8GB (priced at £159 in the UK and $199 in the US) or 16GB (£199/$249) of onboard storage, this tablet runs circles around the Kindle Fire, rivaling many competing Android tablets at twice the price (or more). The 7-inch 1200 x 800 HD backlit IPS display packs a respectable 216 pixels per inch onto the screen. Sure, it’s not quite as impressive as a third-generation Retina Display iPad at 264ppi, but given the price, you will have little to complain about from the display. The front of the Google Nexus 7 by Asus is devoid of hardware-based buttons, but a 1.2MP front-facing camera rests at the top of the tablet front, which is covered entirely by Corning glass (we’re assuming Gorilla Glass, but Google isn’t confirming).